Panic withdrawals hit Cyprus after officials announced bailout terms viewed as 'robbery' by the public, as the UK is reportedly ready to protect British depositors’ savings. The adage ‘the best way to rob a bank is to own a bank’ has perhaps never before held more truth than now. On Saturday, Cypriot deposit-holders got a nasty surprise when they learned that EU ministers and the IMF agreed to massive bailout plan for Cyprus, which includes a one-time tax of 9.9 percent on Cypriot bank deposits that exceed 100,000 euros, as well as a tax of 6.75 percent on smaller deposits. The deal is part of a $13-billion (10-billion-euro) bailout package for Cyprus – which witnessed its banking sector exposed to the Greek financial crisis – to save the country from insolvency. 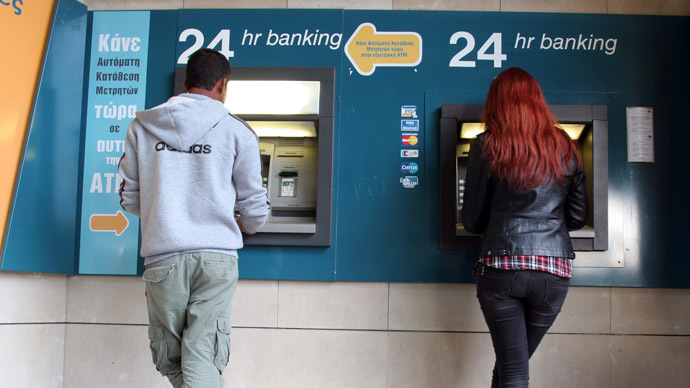 The unprecedented decision, which appears to punish ordinary citizens for failures in the financial system, has sparked panic and protests as people queued up at ATM machines to rescue their savings. Many cash machines ran out of banknotes because of the panic withdrawals – one bank had its entrance blocked with a bulldozer by one disgruntled customer. To further complicate matters, Monday is a public holiday in Cyprus, which means bank customers will have to wait until Tuesday to access their money. 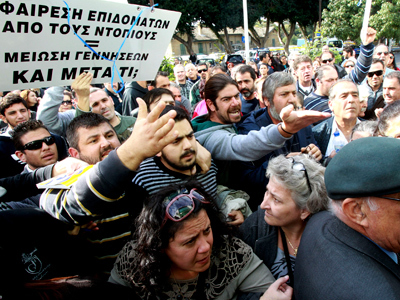 The Cypriot parliament on Sunday postponed an emergency session debating the controversial provision. Earlier, President Nicos Anastasiades postponed an informal meeting of lawmakers called for Sunday morning. Several parties in the 56-member parliament, where no single party enjoys a majority, have already said they will not support the levy. At least one country has already announced plans to protect their citizens’ savings: Up to 60,000 British savers may lose “thousands of pounds each” if the raid on personal bank holdings gets the green light, the Daily Mail reported on Sunday. According to the British paper, Britons have about £1.7 billion in deposits in Cyprus, and could lose up to £170 million. Cyprus banks are reportedly holding around 68 billion euro on deposit, of which foreigners hold about 40 percent; most of these clients are reportedly Russian nationals. It has been estimated that Russian citizens hold between €8 billion and €35 billion in deposits in Cypriot banks, which means individuals could lose up to €3.5 billion total. 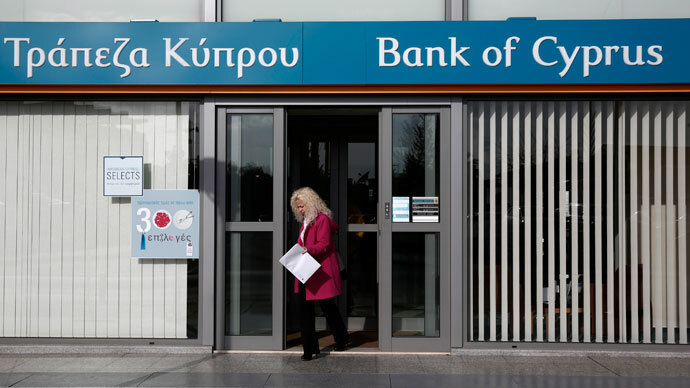 This may account for why Cyprus did not impose a levy on non-EU depositors, since it may have been difficult to distinguish between Cypriot and Russian clients, Jacob Kirkegaard, a senior fellow at the Peterson Institute for International Economics in Washington told the Mail. He compared the situation to other bailout recipients in the Eurozone – namely Greece, Portugal and Ireland – where the native population is forced to shoulder the burden of higher tax rates by themselves. Meanwhile, political analysts fear the decision to slap a tax on savings will create panic withdrawals in other eurozone countries, where investors may think they are next in line to receive a levy on their holdings. 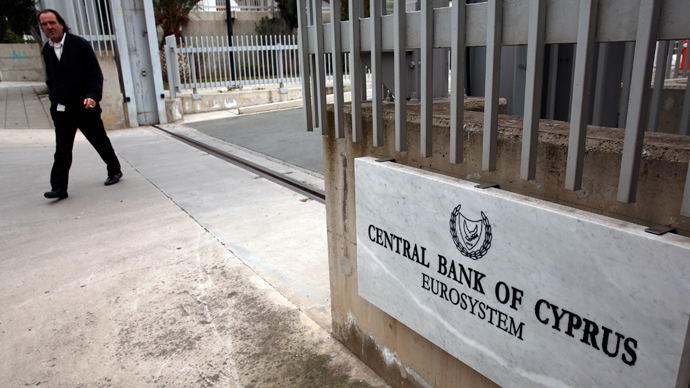 Dr Helen Szamuely from leading British think-tank, the Bruges Group, says she isn’t sure that the bailout will help solve Cyprus’s economic problems, and if it fails the country’s depositors may well take to the streets in protest.